The Ulster County Clerk’s Office is honored to collaborate with the Ellenville Public Library and Museum by providing records from the Ulster County Archives. As you look through the exhibit, you will find records from the Archives that highlight hardworking local women in the early 20th century. 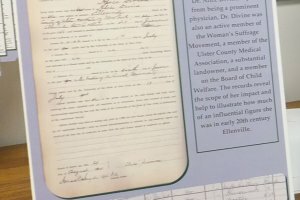 On display you will see Deeds, Farm Registries, Ashokan Reservoir Case Transcripts, Maps, Physician Registries, Photographs, and Census Data from the 1905 and 1915 Ulster County Census records. We hope that the exhibit encourages you to learn more about the amazing women in Ulster County’s history! The Ellenville Public Library is open Monday-Wednesday 9:30am-8:00pm, Thursday-Friday 9:30am-6:00pm, and Saturday 9:30am-3:00pm. The Museum is open Wednesday & Friday 12:00pm-4:00pm, Saturday 10:00am-3:00pm, and by appointment. Please call the library at (845) 647-5530 for more information.